Remember when that was a show on VH1? Remember when there were things you would actually watch on VH1? I barely do, but sometime during the day yesterday the graphics and tagline of that show kept running through my head. I LOVE the week between Christmas and New Year's. Ever since a huge case of mine disappeared in December of 2011 and I got to take that whole week off work and JP was in school so he was home and Claire was about 18 months and just old enough to really start playing with Landon, and JP and I got to do things like sit together on the couch and talk and snuggle and just BE in the daylight while the kids were AWAKE and a whole new world felt like it was opening up before us. Fast-forward 3 years later and I've never again worked on this most wonderful of weeks. It was this week that we hiked all of Austin in 2011, played in a castle and everyone else in 2012, and dragged an infant to all the parks and tourist attractions in Fort Worth in 2013. Both JP and I always managed to be off, which takes being home with the kids for 9 days from potentially yelly and cabin-fever-inducing to free-wheeling and awesome. Errands can be run, workouts can happen, and dinner can easily be made, and in the middle there is tons of playing and giggling and adventures and walks and games and sometimes just he and I standing together in a room smiling while we listen to the kids laugh and make up games in another. It is the best week. I found a new yoga studio- it's on the 2nd story of a building on the Trinity River and it's so peaceful to watch the water flow past and know those same droplets will end up in Lake Livingston and could flow right by my parents' house. I've gone every day since we got back on the 27th. Also, in a fit of reorganizing and redecorating inspired by the new kitchen, I've been to Marshalls, TJ Maxx, Homegoods, and Ross about 4 times and have updated the living room area. I still need a chair for the corner and I'm not completely certain about my bargain side table, but I do love the updated look. Which table do we like better? the bar stools are here! As we settle in to the new kitchen, I realized we didn't have a good junk drawer or space to put all the things you inevitably set down on the kitchen counter when you walk in the door, so I moved the skinny chest of drawers to a new space and it now holds all the desk supplies, mailing supplies, thank you notes, and other odds and ends. The bowl on top is for JP's wallet and keys and it's been working so well. It was that move that inspired the rest of the shopping that brought me my beautiful new silver chest in the living room (housing art supplies and extra copies of photos and frames). Homegoods is the best. still in search of a new non-wicker patterned chair. We've been to the zoo, JP has gone to swim practice every morning, the kids spend a lot of time pushing a squealing Corabunny around the house on her new ride-on-toy, and we're going to belatedly do sugar cookies tomorrow. I've had many moments in the past few weeks where I've been deeply sad at getting increasingly close to not having a baby in the house anymore. That this was our last Christmas with a baby. That footie pj's and joyous baby claps and those soft heavy sighs a baby makes when they rest their head on your shoulder just before bed... that all of that was going to be a memory. I've never felt this way before and the toddler years are my very favorite, so I know I have much to look forward to, but I just couldn't shake it. I genuinely want to freeze Cora or at least reallly slow her down and I feel a little overwhelmed at times just how quickly her babyhood is flying by. I think it's having the big kids around- the more trying aspects of having a baby are so diluted by having other kids to focus on and the awesome aspects seem magnified a hundred fold when you have three other people in the house so delighted by them. And because we have big kids, we are out doing fun things all the time that you would never do if you just had a 13-month-old in December (like going to the zoo in 35-degree weather), but the big kids had a blast and Cora has fun and we're out of the house and it would really be best if she could just stay our walking, babbling, clapping 1-year-old mascot forever. Pretty please. But then yesterday I was watching her really play with Landon and Claire. L&C had built a fort with their PBK chairs and new sleeping bags and Cora's slide was the exit ramp and Cora was going down it and screaming in joy and then crawling into their tent and sitting up, looking SO proud to be part of this very official Big Kid Game, and I remembered that this is fun too. That 18 months is my favorite, as is 2 and 3, and all the kid years we've seen so far. That for over an hour JP and I did our own thing while occasionally popping a head in the other room to make sure Cora hadn't wandered off, but no, there she was, in the middle of it all and having a glorious time. Three kids is a party. Mildly chaotic, but truly so much fun to be part of. Especially when you can opt for a supervisory part while you lounge on the couch reading a book about romantic time traveling Druid Scottish Highlanders from the 16th century. 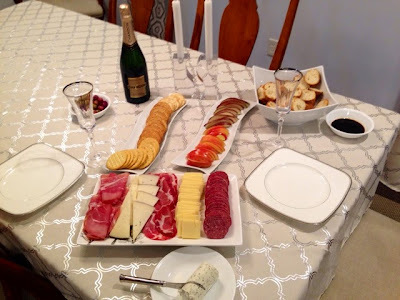 Alright time to google a fake New Year's Eve countdown for the kids before JP and I can light some candles, pop the champagne, and get on with our own fancy NYE Quartino night- the meat and cheese and dark chocolate desserts await! Wishing you all a fun and safe farewell to 2014 and a fabulous 2015! Every year that the kids get a little older (and as we keep adding more of them), Christmas just gets more magical. Like actually magical- they are just SO excited and so sweet and so full of wonder and belief in impossible things. I love it. We headed to my parents' lake house again this year, which was as fun and delicious as always. It's still weird to me that my kids associate Christmas with a lake house and their grandparents, since neither of those things were part of my Christmases growing up, but it has been a wonderful way to celebrate the holiday each year. For the first time ever we didn't drive back to Kingwood for Christmas Eve church and dinner. I was concerned that Christmas wouldn't happen if we didn't eat our flank steak in the mirror-paneled dining room on my great-grandmother's china, but happen it did. We also forgot the Bible, so I did the gospel reading from my iPhone. A sign of the modern times. We went to a little Methodist church in town- built in 1848 and utterly charming, one little boy even had the honor of pulling the long rope that rings the bell in the steeple. Adorable. Cora fell asleep during the service, but perked right up for present-opening time. Last year she was just a sleepy little peanut, and this year she was a full and active part of all the festivities. Christmas is basically her new favorite thing. The kids were so excited she was opening her presents this year. She didn't get many (the girl has a ready-made playroom thanks to her big sibs), but oh was she DELIGHTED by them. JP surprised me on Christmas Eve with a second diamond band to complete my wedding set. It was a very big surprise that he was clearly as excited about as me. It's a symbol of several things- our upcoming 10th wedding anniversary, the success of his swim school and my support of it (and some remuneration for my role as VP, Secretary, Drafter of Emails, and Officer Determiner of "Yes That Parent is Being Ridiculous Stop Worrying About It and Go To Sleep"), and making it through a year with some unique challenges for us. Christmas morning was full of excitement. Landon got a badly needed new bike from Santa (his old one was about 4" too short), Claire got a scooter ("Mommy, I whispered what I wanted to Santa and he HEARD me! "), and Cora got a Little People Doll House. Claire also got a bevy of new fashion accessories in her stocking- rainbow scarf, faux rhinestone bracelet, and sparkly headbands. She wore all of these things all day with her new Elsa shoes from my grandparents. Oh my GOSH does she love those shoes. Best clearance Target purchase ever. I love that they're real shoes, so when she asked to wear them to the grocery store, I get to say, sure! As always there was lots of eating and playing and eating and playing. My form is really spectacular. It was a lovely and relaxing time. JP and I beat my parents twice at the beanbag game, though they inexplicably still claim they're undefeated. We drove to my aunt and uncle's house yesterday and had a fantastic time with more gifts, playtime, and deliciousness. Pics from that later. We got home last night and spent our day today unpacking, cleaning, reorganizing, and restocking our fridge and pantry with food. I made dinner from scratch tonight- I used 3 pots and pans, two gas burners and the oven, and zero microwaves and it made me smile. As does this picture. JP loves when I make him take pictures with me. So our kitchen is done and Christmas is allowed to happen. I finished the unpacking and cleaning and decorating about twenty minutes before my parents and brother arrived last Friday which was approximately forty minutes before Claire's school holiday pageant was set to begin. She was SO excited to wear her Christmas dress and beloved "fancy shoes" that have been taunting her from her closet for weeks. I love her love of shoes. The program was as earnest and adorable as a school program should be. Christmas poems + hand motions are a very serious business. She then basked in the post-performance glow with her Gigi, gave my family a tour of her classroom, before we headed home to eat dinner (in the new kitchen! nothing was microwaved!) and decorate the tree. Normally I prefer to do the tree the weekend after Thanksgiving and enjoy it all season long, but the whole house was such a disaster and this corner was needed to stack up boxes of kitchen stuff (SO much stuff lives in your kitchen cabinets; I was shocked how many boxes it all required), so after my 24 straight hours of cleaning, it was finally time to pull out our new fake tree. JP vastly prefers live trees, but I knew this year any tree trimming would be last minute, so we've compromised on fake for this year and a fake AND a real one in the future. We're going to need more ornaments. Cora was respectful of the tree and its traditions. She's an adorable little mimic and is always very interested in what the big kids are doing. She stood by the tree and seemed to concentrate very hard to figure out what kind of magic they were using to make the toys levitate in the air and stick on the branches. Then she gave up and went to make friends with the Julbock. Christmas music was playing and cookies were eaten and snuggling and giggling happened. The loving laughing joyfully chaotic life of three kids is hard to put it in words, but every now and then there's a picture that gives you a sliver. I love this one. On Saturday it was freezing and rainy, so we thought we should spend the whole day outdoors exploring the Arboretum. It certainly kept the crowds away. The 12 Days of Christmas Exhibits were pretty amazing and of course the Children's Adventure Garden is always a hit. we literally had to drag my parents out of there when JP and Eric were about to abandon the group in search of a much-delayed lunch. In a final nod to Christmas tradition, we scarred the baby by putting her in the arms of a strange old man in a weird outfit. I love how Cora's all, what are you doing? Why are your hands out like that? My daddy would never put me in the arms of a suspicious stranger. It's finally (95%) done! My house is back! Out with the dust and microwave meals and in with the sanity and holiday decorations. We need to find shorter screws to attach a few of the drawer pulls, a flat piece of wood needs to go under all the over-window cabinets, and the cabinet doors need to be leveled- and the bar stools arrive on Monday, but it's pretty much there. I took testimony on Thursday and came home, fed the kids their last round of Easy Mac, put them to bed, opened a bottle of my favorite champagne that a beloved coworker gave me to christen the new kitchen, and went to WORK. At midnight it was nearly all unpacked and then I spent 8 hours Friday running errands, cleaning, unpacking, organizing and reorganizing, and finally FINISHING, and then running out to the garage to grab our Christmas decorations to make Christmas finally arrive in our house and got all THAT done about 20 minutes before my parents and brother were due to arrive from Houston and we needed to leave for Claire's holiday pageant. At 3:30 p.m. I realized all I'd had to eat was a chai tea latte I'd grabbed on my 8 a.m. Target run and the only sitting I'd done was in the car to buy more organizers. It was a crazy day. But I love it. I love it so much. Our old kitchen wasn't terrible. It was functional and perfectly fine looking, but it was a big space that couldn't have been more poorly designed (so much wasted space!) and was completely cut off from the rest of the house. Every night I would get home from work with the kids, they'd go to the playroom, and I'd go in the kitchen and I pretty much wouldn't see them again for an hour. The kitchen was too narrow to safely have them in there with me and I hated the separation. Above: random peninsula jutting out 1/3 of the way into the room with a tiny dorm microwave hidden in a lower cabinet on the other side; big wall cutting off my view of anything except the wall while cooking. Below: counter top that inexplicably ended 4 inches past the sink with another huge amount of empty wasted space; and two small pantries on opposite ends of the rectangle. So we saved and I planned and pinned and drew 1,000 sketches of my dream floor plan. I solicited contractors in January to get bids and see if what I wanted to do was architecturally and financially possible. I googled and pinned and houzzed all spring. We picked our contractor and got to work in earnest in the summer. We had the cabinet maker over in the fall. He stalled on giving us a quote and we had to give up on him in October and move on to another company. Everything was delayed. The appliances we'd excitedly purchased in September sat in the warehouse at the store forever. The cabinets were finally ready to go in mid-November and we had our contractor get going with demo even though he was going to be gone for a week at Thanksgiving, and while it was miserable to have an extra 10 days of no progress on the project (we were gone for half of them, but still, it messed with my mind to have the chaos so unchanging), I'm so glad to have the project done before Christmas. The granite was a saga. I obsessed over the same four shades of grey paint. I hated the first set of cabinet hardware I'd ordered online. The cabinet install was wrong and we had to pay more and wait two weeks to get a bunch of the boxes re-done. I took a half-day off work to stand behind our contractor's shoulder to free flow design our built-in cubbies. Everything was worth it. In all of my kitchen design research it would drive me crazy to see a picture I loved that had no details on how to get anything in it, so I'll link to a bunch of things below. I was also starving for details, so I've included lots of those. Apologies to the non-HGTV addicted in advance. So, let's take a tour- begone giant wall! We used to only have a doors-width opening between the two rooms. New view while cooking on the stove. Trash/recycle bin drawer to the right of the sink, another stack of drawers for all the plastic cups and lids and lunch box storage containers, and a little silver button above the sink that turns on the disposal. I still get a little thrill every time I push it. I also love the over window line of cabinets; no one liked that idea, including JP, but it totally completes that wall and they're storing all our serving dishes and other rarely used items. My new big pantry and beloved cubbies. The original plan was for that to be all pantry, but I wanted to save the window and a big pantry wasn't going to fix our overflowing backpack/jacket rack problem, plus I didn't like the idea of walking into a big long wall and narrow hallway (that side door is the one we use to come in from the driveway), so I redrew the plans and cut into the pantry for some cubbies that would face the door. Our contractor was skeptical, but they are probably my favorite thing about the whole redesign. Peninsula with my beverage fridge, drawers for all the things (including pot and pan drawers that I've wanted forever), and so much counter space. We "built-in" our old fridge and the big cabinets on top are awesome for all our Costco paper products we used to stuff in Cora's closet and then we'd inevitably run out of paper towels or toilet paper after she went to bed and have to sneak in to get more. And no more peeling vinyl tiles in the entry! And I finally got to unpack all our glasses! Another fave: I wanted a shelf and wine storage built into the end cap of the lower cabinets to hide the lunch boxes (and my wine). I didn't want to do too much custom cabinet work because needs change, and the contractor was not too sure about it, but I already love that tucked away space. And now that the dust and debris are all gone, Christmas finally got to come to our house! Bar stools: CB2 Phoenix Ivory 30" Bar Stool (I picture much homework and breakfast eating being done on these). After one million design decisions and internet bookmarks and microwave dinners (and SO MUCH DUST), I am SO glad it's done and that we love it so much. I've never looked forward to making dinner more!